Outward Bound courses are held in numerous locations throughout Croatia! We at Outward Bound constantly seek for new, beautiful and exciting locations for our program. With Croatia’s intact nature and beauty, crisp clean water and sea, mighty mountains and picturesque valleys, numerous national parks and protected areas, we are privileged to be at service to Outward bound participants at sights that are among most beautiful in the world. Velebit is the largest mountain in Croatia, stretching form the Alps and located along the Adriatic coast. It is a typical karst mountain, composed largely of carbonate rocks with huge freshwater reserves. The highest peak of the Velebit Mountain is Vaganski vrh (1757 m a. s. l.). The coastal slope is very rocky and bare and the inland, although steeper, is almost completely covered in forest. Almost the whole area of Velebit is protected as a nature park and some parts are even protected in a category of a national park, so there also 2 national parks – Paklenica, karst river canyon and Sjeverni Velebit with its´ abundant variety. Some of the protected properties are: strict reserves Hajducki and Rozanski kukovi, special reserve of forest vegetation (Klepina duliba), special botanical reserves (Visibaba and Zavižan-Balinovac-Velika kosa), geomorphologic nature monuments (Cerovacke caves and Modric cave), protected landscape (Zavratnica), paleontological nature monument (Velnicka glavica) and several archaeological and paleontological localities. It is also a home to numerous plant and animal species, of which a lot of them are endemic and protected species, including the brown bear, wolf, lynx and otter. In order to preserve the biodiversity of Velebit, in 1978 UNESCO enlisted it into its international network of biosphere reserves under the Man and Biosphere Programme. Dabarski kukovi are rock ridges located in the center part of Mt. Velebit and their names come from a folk name given to large stone masses which rise up. It is distinguished by many karst formations, like caves, pits and ridges and unparalleled diversity of plant and animal life. As part of true wilderness in Croatia, it provides an excellent setting for longer courses with many activities like rock climbing, caving, bivouacking, expeditions etc. The Premuzic trail, a popular fifty seven kilometres mountaineering route across the Velebit peaks connects the top parts of northern and central Velebit. The walking route is a true masterpiece of architecture because it was built in stone – drystone and was named after its builder Ante Premuzic when the path was completed in 1933. There are beautiful views over the Adriatic Sea and nearby islands. The Premuzic trail passes a number of ruined summer lodges that represent the area’s culture from the times of shepherds and farmers. Veliki Žitnik, a small vilage 7 kilometers away from city of Gospić, is the home of our Educational center, our ‘base’ with a purpose to work with children. Education center was a generous donation from City of Gospić which we received in 2010. as old, dilapidated school for 30 years long usage. 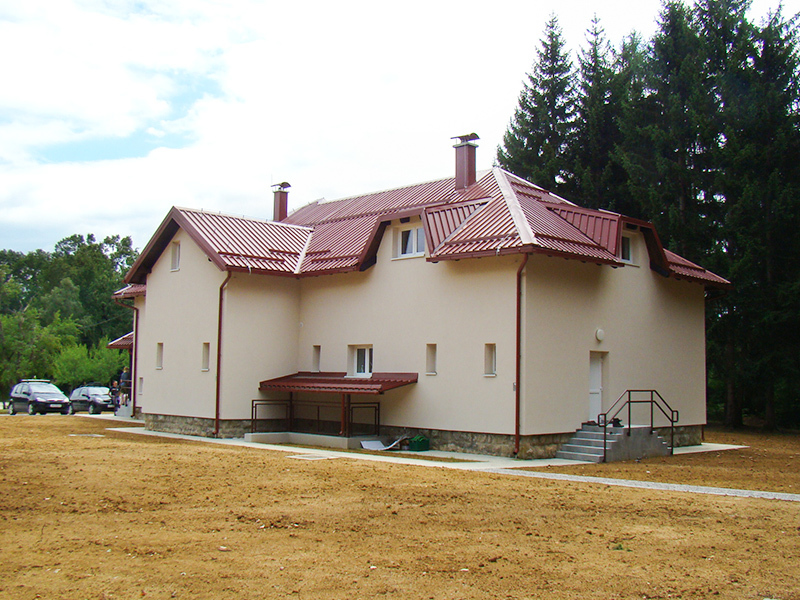 In July 2016 thanks to our donors Educational center shined in a new shiny light and now it is a new and renovated place through which many young people from Croatia and the world is passing. Today our Educational center has 30 beds, a professional kitchen and space for instructors. By its origin, is a flooded plain surrounded by steep 100 meters high canyon cliffs. Around 900 m long, the Bay’s width varies between 50 and 150m. It was formed by layers of Cretaceous origin, which, chipped and rugged over centuries, created numerous screes. Drystone walls, planted trees and low shrub prevented further spreading of screes. One-hundred out of 129 plant species that have been found in Zavratnica are indigenous, while 29 are of foreign origin. The upper trail with the lookout and the trail along the sea were built at the beginning of the 20th century. At that time Zavratnica became a refuge and a popular summer destination for the Viennese and Prague elite. The panorama of Zavratnica is unique: blue sea in the bay is connected with gray colors Velebit, sometimes streaked with green sparse vegetation. Lake Kruscica (Croatian: Krušćičko jezero) is an artificial lake located in Kosinj, Lika. The total lake area is 3.9 square kilometres (1.5 sq mi), while its elevation is 554 m.a.s.l. It was named after the village Kruscica which is on the site flooded, and residents moved out into the surrounding countryside. Rab island covers 93.6 square km. It is one of the greenest islands in the Adriatic. Rab is covered with pine forests and has beautiful sandy beaches, and is well known for its mild climate which differs from the mainland. Special importance in the formation of the climate character has Kamenjak mountain chain that protects it from the wind, like a mounted natural wall. The main resort, Rab Town, is full of medieval buildings, built during the Venetian rule, which occurred since the 13th century. The old town walls are still visible in some places. Mountain of Zagreb gives many opportunities for experiential learning courses, and it’s vicinity to the capital makes it a very attractive location. It is ideal for short, one or two-day presentation courses for schools of Zagreb. The Croatian coastline together with its islands ranks among the most intricate indented coastlines in the world. There is a 1244 islands, islets, cliffs and reefs of which only 50 are inhabited, so Croatia may justly be called the ‘land of a thousand islands’. The Adriatic is the northernmost arm of the Mediterranean Sea, extending from the Strait of Otranto (where it connects to the Ionian Sea) to the northwest and the Po Valley. Also the Adriatic Sea and its surrounding landmass enjoy the Mediterranean climate. The Adriatic Sea is where Roman, Byzantine, and Venetian sailors as well as today’s sea-lovers have all appreciated its luminous waters. Its gorgeous beaches, green forested valleys, turqoise Adriatic Sea, and beautiful historic cities which have kept their old romantic flair, will leave you breathless! Attractive scuba diving locations in the Adriatic also draw a large number of divers. During the summer months the temperature of the Adriatic Sea varies between 21 and 25 degrees, therefore, ideal for diving. It is full of interesting underwater flora and fauna, (more than 7000 species and some of them are endemic) as well as shipwrecks dating back to ancient times. The Lika is a 77 kilometres (48 mi) long river in Croatia which gives its name to the Lika region. It is known as a sinking river because at the end of its course, it flows into a series of ponors or swallow-holes and disappears from the surface. The Lika River rises at the foot of the Velebit Mountains, flows in a northwesterly direction past the town of Gospic, enters and leaves Lake Kruscica, and continues to the northwest until it sinks into the karst topography at ponors near Lipovo Polje.